[Luis Cruz] built a gaming console with motion control. The circuit above connects via composite video to a television and communicates with a wireless controller. 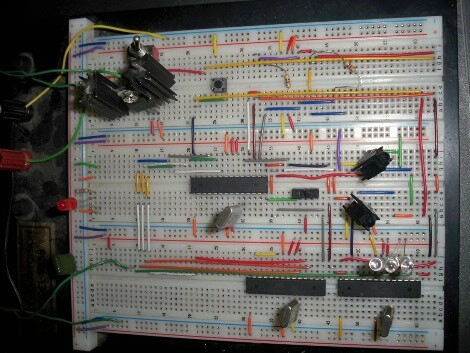 The controller is on a smaller breadboard which includes an accelerometer for the input and the infrared circuitry necessary for wireless data transmission back to the home system. Take a look at the first game he developed for it in the video after the break. There’s some details available (ie: he’s using ATmega168 and ATmega328 chips) but we’ve asked him to post code and schematics which he is currently cleaning up for mass consumption. Ah, the 8-bit sound in that game takes us back to the glory days of Atari and Intellivision. 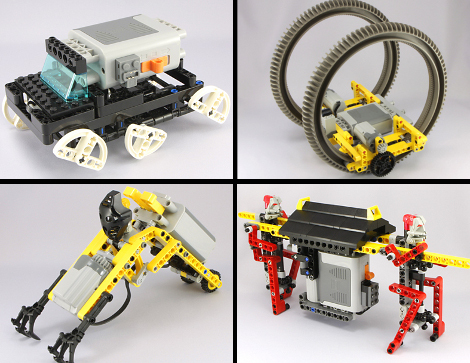 Here’s a collection of little LEGO oddities. Some of them exhibit a purpose, such as this interesting take on a line-following robot. Others, like the four seen above, are just automatons built to bring a smile to your face through their motion. There are dozens to choose from, with several pictures and a video of each. See the clips of these four after the break. Oh, and don’t worry, we didn’t find any LEGO iPhone docks, just cleaver mobile creations. Going camping? 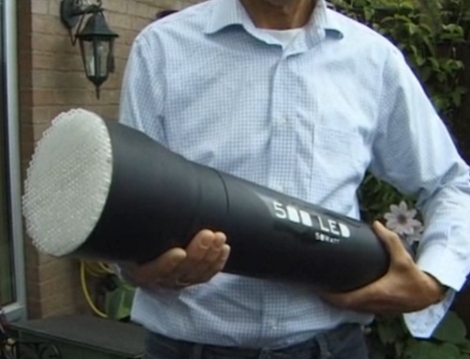 You’ll need an extra backpack to carry this flashlight along the way. On the business end you’ll find 500 five millimeter super-bright white LEDs, on the opposite end there’s ten times the number of controls you’d expect on a flashlight. At full power, the LED array pulls down 50 Watts, making us question the battery life of the unit. Check out the walk-through after the break. The LEDs are mounted on proto-board, making for some extreme point-to-point soldering. During the control demonstration there’s a background noise like a jet powering up, what’s that all about? While this terrific torch brings a grin to our faces, we wonder if it wouldn’t do better as a vehicle mounted illuminator. Or if a microcontroller was tossed into the mix some creative code could make this a pretty powerful yet non-lethal weapon. [Keith] built this aluminum-plate heated build stage for his MakerBot 3D printer. We just saw a different MakerBot heated build stage yesterday that relied on glass as the printing surface. Keith’s design is similar to the aluminum RepRap bed but scaled down for the MakerBot. He had a piece of aluminum machined the to correct dimensions, and perfectly flat to use as the printing surface. 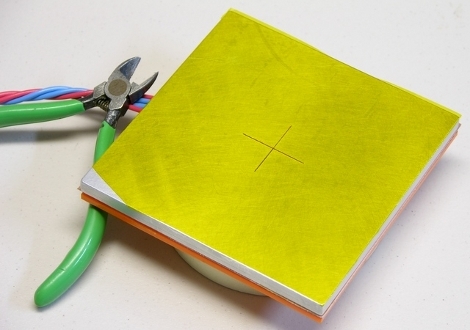 The yellow surface is caused by Kapton tape applied to the top of the plate. This heat-resistant covering is perfect to print on, resulting in glossy smooth surfaces that are easy to remove once the printed part has cooled. He’s working on improving his mounting technique to achieve prefect level so that he can print without a raft. [Keith’s] writeup is phenomenal. He’s sharing knowledge in a way that is useful even if you’re not building the exact same kind of project. Follow his lead with your own write-ups, then let us know once you’ve posted them. 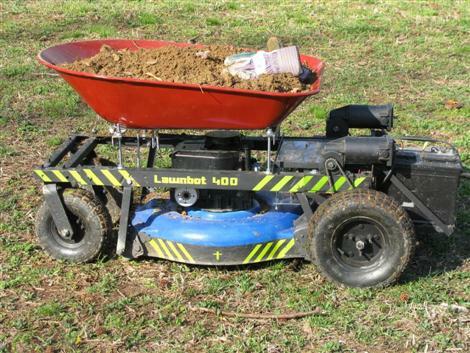 Driven by the relentless nagging encouragement of the Hackaday commenters, [Johndavid400] has improved the Lawnbot 400. No longer does it just sport a makeshift wooden shelf. he now has a wheel barrow attachment. It looks quite sturdy as long as that front hinge holds out. There is an actuator coming in the near future for dumping the contents as well. Also, we suspect that might be a shovel in this picture. 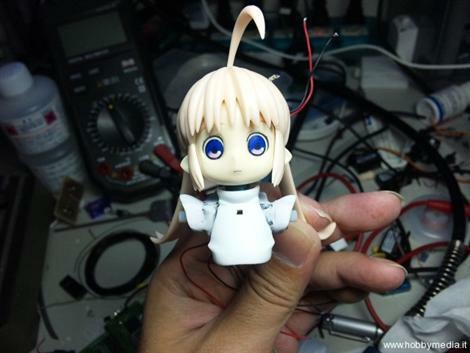 Here at Hackaday, we may be somewhat divided in our opinions of Anime and Manga. We were all pretty impressed by this robot build(translated) though. We’re not totally clear on who actually did this build, but we can see a few pictures and a video on the site. The original doll looks to be roughly 3 or 4 inches tall, judging by the Eeepc keyboard that it is standing on. We counted 7 servos stuffed into this thing with a controller board hiding in the back of its hair. You’ll have to watch the video to see most of the details. It looks like there is one in the head, one in each shoulder, both hip joints, and both feet. Though the motion at the end of the video is limited, we still think it is impressive. Creepy, but impressive. note: the video is not embedded in the translated version. Just go to the non translated to watch it.